Only $77 for current Robot customers! Log in to show the $77 buy button. Only $59 for Multi-Pair Indicator customers! Log in to show the $59 buy button. 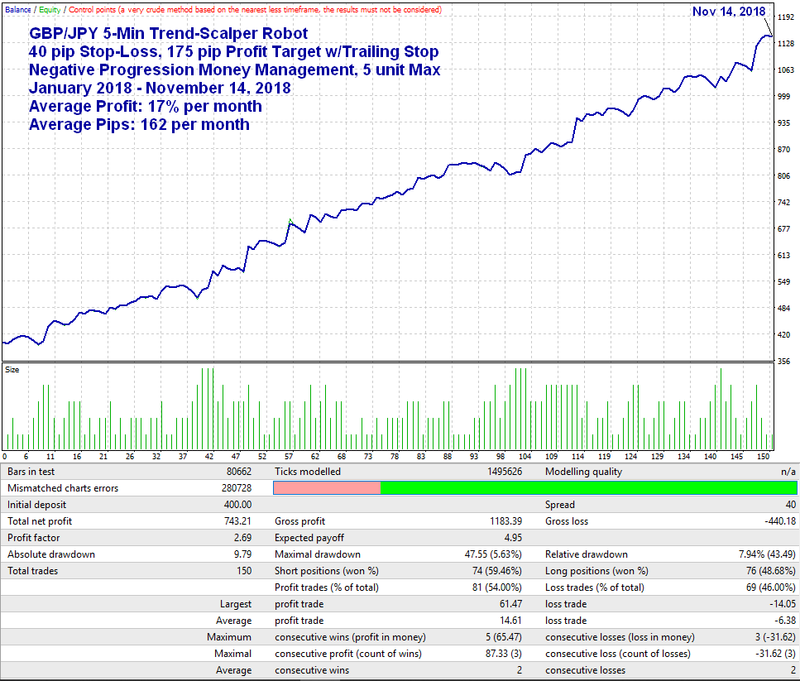 This GBP/JPY 5-Min Trend-Scalping Robot is optimized for the 5-minute candlestick chart. It enters on pullbacks in the direction of the current short-term trend during a 3-6 hour trading window, depending on the preset file you choose to run. Change from Consecutive Wins to Cumulative Wins strategy with a True/False switch. Change from Positive Progression to Negative Progression with a True/False switch. Activate the "Stay At Max" technique with a True/False switch. This EA includes preset files for many different settings. All are good but some trade more often than others (longer trading hours) and some use larger stops than others. You will need to choose the preset file that best fits your trading style and broker. For example, if your broker widens spreads on the weekend (like Oanda), then you should use the preset files with a 60 pips stop-loss instead of 40 pips. Likewise, if you want fewer trades with a higher win rate, then use the preset files that trade fewer hours per day like 6-10 or 7-10 instead of 4-10. Preset files are included for price data on the following time zones: GMT and GMT+2 (Jerusalem time). Most forex brokers' price feed is running on one of these two time zones. This represents the time on your charts and NOT your computer's local time or the time zone of your broker's office location. This strategy uses Negative Progression Money Management with a 5-Unit Maximum lot. It increases the lot size by 1 unit following a "qualifying" loss (35 pips or greater) and decreases the lot size by 2 units following a "qualifying" win (45 pips or greater). It uses a 1-step trailing stop-loss. 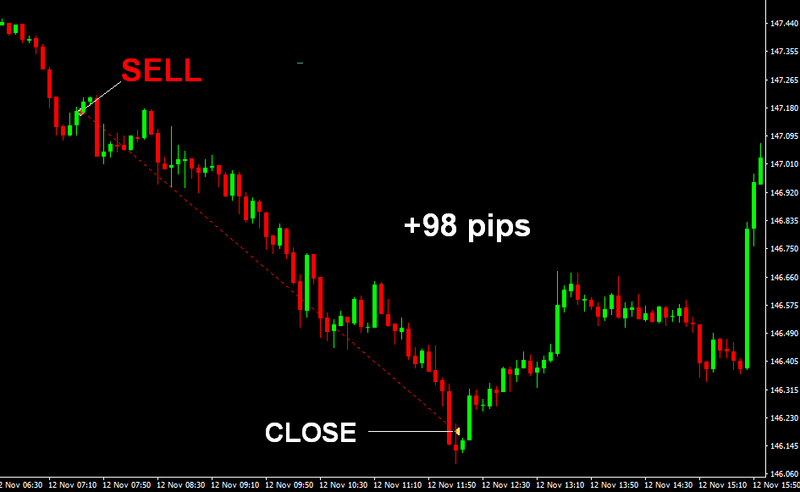 At 50 pips profit, it moves the stop-loss to -15 pips and does not move it again. With Money Management applied, the average win is 2.2 times the size of the average loss. 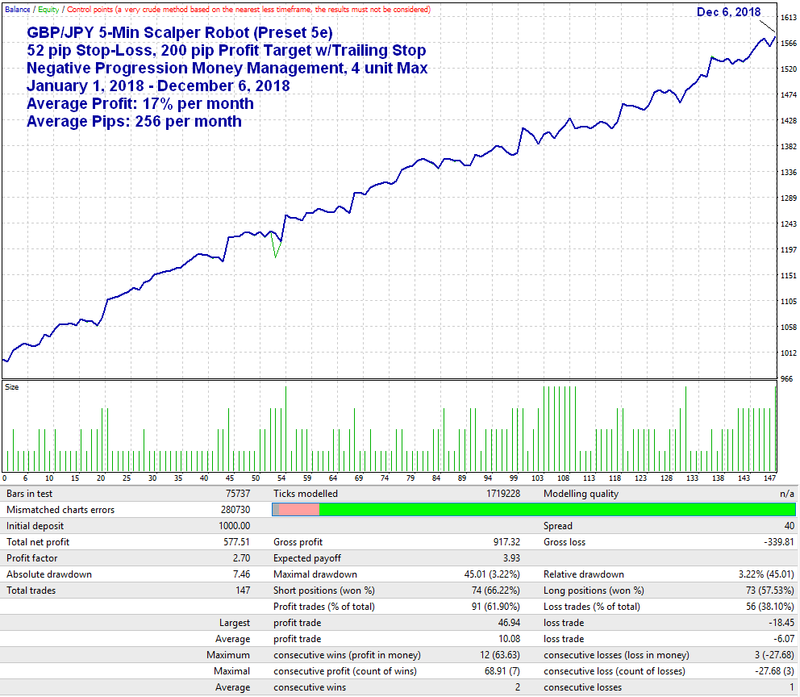 This model trades 6 hours per day and averages 162 pips and 14 trades per month. At my maximum recommended leverage, it averages 17% per month. The backtest below was made on 5-Min data from IC Markets standard spread account (not ECN data) using a 4 pip spread (a setting of 40 in the Strategy Tester). This is the default settings in the EA. Below is the name of the Preset File used for the backtest shown above. Just load it in your EA Properties. NOTE: The $400 margin per 0.01 Minimum Lot recommendation is the MAXIMUM recommended leverage. This is especially important when trading at brokers that have high margin requirements for GBP/JPY like 30:1. Despite the $47 max draw-down in the backtest shown above, these settings can potentially generate peak-to-valley draw-downs over $100 per 0.01 Minimum_Lot and 0.01 UnitSize_Up setting so you should anticipate that it will eventually happen. On a $400 balance, a $100 draw-down is 25%, while average monthly profits are around 17%. Following a $100 draw-down, you should still have enough margin in your account to open a 5-unit trade and this is why I recommend a minimum of $400 per 0.01 Minimum Lot. If your goal is more than 17% per month and your broker offers AT LEAST 1:100 leverage, you should really consider using the Cumulative Wins model shown further below (preset file 4d), which uses Positive Progression Money Management. The equity curve is not as smooth but using positive progression money management makes it safer, allowing for higher leverage and higher potential returns. Compounding Tip: You may compound profits monthly, or as often as you wish, but you should only compound profits when the next trade should open at your Minimum Lot setting to avoid interfering in the position-sizing strategy. UTC/GMT time is located below all the city times on the World Clock (link above). 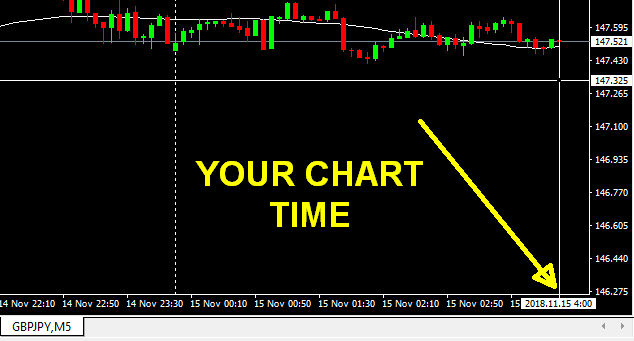 If your chart time matches GMT, then use the preset files labeld GMT. If your chart time is 2 hours later than GMT, then use the preset files labeled GMT+2. If your chart time does not match either one and you're not sure what StartTime and EndTime settings to use, please contact me so we can figure it out. This applies to all models of this EA. This strategy uses the HMA indicator as the primary moving average and has one of the highest average pips per month of all the preset files included with this EA. Click Here for more info about the HMA indicator. This strategy (preset file 5e) uses Negative Progression Money Management with a 4-Unit Maximum lot. It increases the lot size by 1 unit following a "qualifying" loss of 39 pips or greater and decreases the lot size by 3 units following a "qualifying" win of 60 pips or greater. 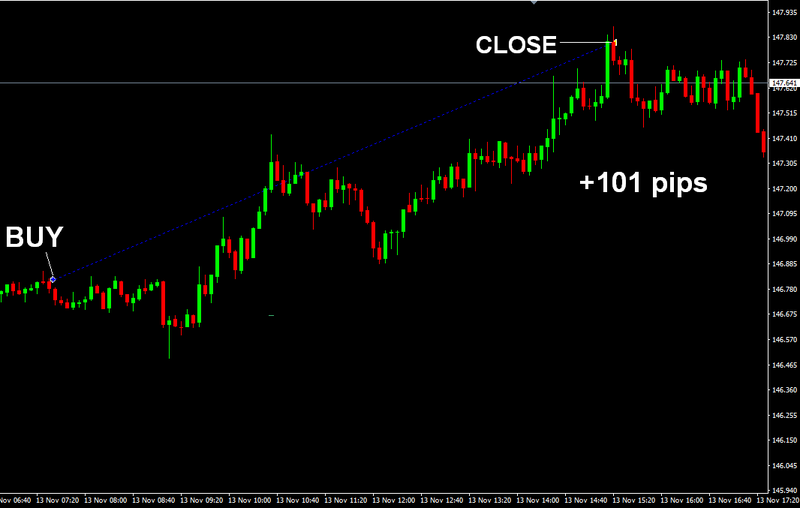 It uses a 1-step trailing stop-loss: at 40 pips profit, it moves the stop-loss to -20 pips and does not move it again. 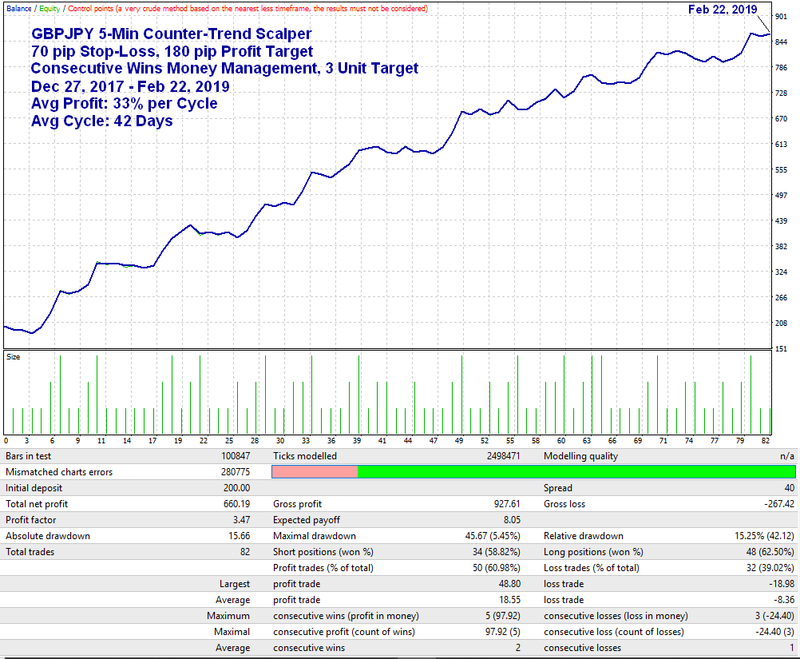 This model trades in a 5-hour & 20 minute trading window per day and averages 256 pips and 13 trades per month. At my maximum recommended leverage at a broker offering max 30:1 to 50:1 Max Leverage, it averages 17% per month. The backtest below was made on 5-Min data from IC Markets standard spread account (not ECN data) using a 4 pip spread (a setting of 40 in the Strategy Tester). Using Negative Progression Money Management with this strategy does not improve the profit to draw-down ratio but it does create more frequent profit highs and a more consistent equity curve. NOTE: The leverage settings shown above are my MAXIMUM recommended leverage and is doable at brokers that have high margin requirements for GBP/JPY like 30:1 or 50:1 max leverage. Despite the $45 max draw-down in the backtest shown above, these settings can potentially generate peak-to-valley draw-downs over $100 per 0.01 Minimum_Lot and 0.01 UnitSize_Up setting so you should anticipate that it will eventually happen. On a $300 balance, a $100 draw-down is 33%, while average monthly profits are around 17%. Scale this model up as your account grows but always make sure you have enough margin in your account to open a 4 unit trade following large draw-downs and adjust your lot sizes accordingly. 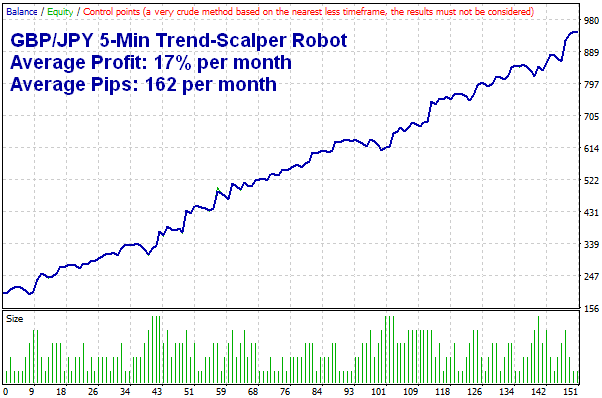 This EA is included in your purchase as a FREE BONUS so you have a scalping strategy for all market conditions. This counter-trend scalping EA uses opposite logic as the Trend-Scalping EA detailed in the trading models shown above and trades at a different time of day. While the Trend-Scalping EA featured above buys "above" the primary moving average and sells below it, this Counter-Trend Scalping EA buys BELOW the primary moving average and sells ABOVE it. This typically gets you into trades at a better price (or on a pullback in a larger trend) since this strategy is running on a 5-min chart. The "Scalping" feature is more about the exits than the entries since it's easier to exit following a big move in your favor than it is to predict when it will happen and this EA has 2 different types of exits following spikes into profit. One for large 1 to 3 bar spikes (as shown below) and another for larger spikes usually involving many more bars (typically strong surges in a trend). If neither of these occur, then the stop-loss, trailing stop, or profit target will ultimately close the trade. The model shown below is using "Positive Progression" Consecutive Wins Money Management but you can change this to Negative Progression using a True/False switch in the settings. Using Positive Progression Money Management is safer and offers much higher profit potential since it snowballs lot sizes on winning streaks and quickly drops lot size following "qualifying" losses. The model shown below is the default settings and trades in a 1-hour window per day when price is usually pulling back from the previous session's move. At my maximum recommended leverage, it can average up to 33% every 42 days (the average length of a money management cycle). The backtest below was made on 5-Min data from IC Markets standard spread account (not ECN data) using a 4 pip spread. Compounding Tip: You should compound profits only after a qualifying win at your cycle target. When changing lot sizes, detach and re-attach the EA (or restart MT4) to clear out the previous "Minimum Lot" setting that may be saved in memory.